Custom Built Chimneys - Constructed on site using factory made flue liners. System Chimneys - Prefabricated chimney systems. Manufactured in a factory and assembled on site. The key benefits of chimney systems lie in their off-site production and preformed insulation. 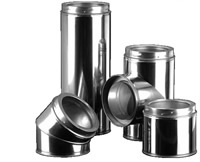 Connecting Flue Pipes - Pipe specifically designed to connect an appliance to the flue or chimney. Chimneys and flues are also available in a number of different materials – stainless steel, concrete, pumice, clay or ceramic and plastic. Concrete, pumice and clay or ceramic are collectively referred to as masonry chimneys. 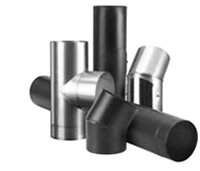 Plastic flues are only allowed to be used with low temperature condensing applications. Care must be taken to check the designation of stainless steel chimney systems and flexible liners as a limited number are specifically designed for use with gas fired appliances. These must not be used with wood burning or multi fuel appliances. Clay and pumice chimney systems and liners are suitable for wood, multi fuel, oil and gas. 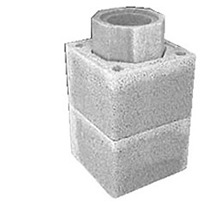 Concrete gas flue blocks as the name suggests are only to be used with gas effect fires and must not be used with wood or solid fuel fires. 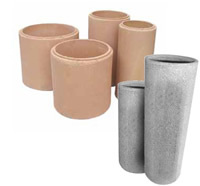 Factory produced pumice and ceramic chimney systems are also available. Although they can be retrofitted, pumice and ceramic chimney systems tend to be used in new houses, because they require a foundation and their construction method is best suited to the skill set of a bricklayer. 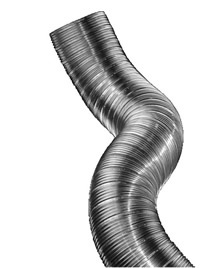 Stainless steel flexible liners are certified to BS EN1856-2. Flexible liners are used to reline an existing chimney. Care must be taken when selecting a flexible liner. Twin skin liners, manufactured from overlapping strips of high grade stainless steel to give a smooth sealed flue-way. These liners should be used with wood and multi-fuel appliances. Single skin liners must never be used with wood or multi-fuel applications. To be certified as a system chimney the components used with the flexible liner must also have CE Approval. Clay/ceramic flue liners are manufactured from a specially selected blend of fire clays in a range of sizes in both round and square to suit the range of wood and solid fuel appliances and open fires. BS EN 1457:2012 part 1 specifies the technical requirements for clay/ceramic liners to be used in dry, non-condensing conditions. Pumice and concrete liners are certified to BS EN 1857:2010. The difference between concrete and pumice chimney products lies in the degree of pumice used in their manufacture. The Schiedel pumice liners, for example, are manufactured with 100% pumice aggregate. Cement is used to bind the aggregate with the result that the percentage of pumice in the finished product is still over 90%. Pumice is made from volcanic rock and its importance in chimney construction comes from the fact that it is a natural insulator. To form a chimney, the liners have to be surrounded with at least 100mm thick brick, block or stonework with the gap in between filled with a suitable insulating concrete mix. Clay, pumice and concrete liners can be used to reline an existing chimney. Concrete and pumice liners should not be used with condensing applications. Stainless steel system chimneys consist of two concentric stainless steel metal walls with insulation filling the annular space between them. Some systems have a ceramic liner, which can offer a longer life. Factory made system chimneys are easy to handle and available with a wide range of fittings such as elbows, terminals and tees, all of which simple lock or push together. They are easily assembled and supported with purpose designed support brackets. These products, which can be used internally and externally, must be certified to BS EN 1856-1:2009. Stainless steel systems tend to be used in existing buildings that do not have a chimney and extensions, because they do not require a dedicated foundation and can be easily retrofitted. Under the new BS EN 15287-1 twin wall system chimneys can now be used as a connecting flue pipe and also to reline an existing chimney shaft. Pumice chimney systems are certified to BS EN1858:2008. Double wall pumice chimney systems, known as Double Module, are able to exploit the natural insulating properties of pumice and do not require any further insulation. Pumice systems are lightweight and come with a range of accessories designed to facilitate use with stoves. Pumice chimney systems should not be used with condensing applications. Ceramic chimney systems are certified to BS EN13063-1:2005. Ceramic chimney systems and liners are suitable for wood, multi fuel, oil and gas and condensing applications. 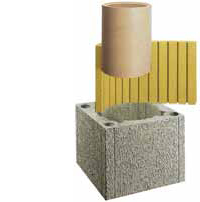 The inner ceramic liner is insulated with rock wool and contained in a preformed concrete block. Connecting Flue Pipes are designed to connect the appliance to the flue. The pipe is usually decorative because it is visible in the living area.The options are vitreous enamel or single wall stainless steel. Vitreous enamel is the most commonly used option. Single wall stainless steel is certified to EN1856-2.The vitreous enamel coating should comply with the recommended requirements for high resistance to heat in BS1344 part1:1994 part 7:1984 and acid resistance BSEN 14483-1:2004. The European Standard for vitreous enamel low carbon steel flue pipes is BS60009-1989. 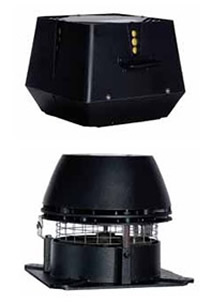 Chimney fans are mechanical draft systems designed to resolve chimney draft problems. Systems are available for use with a wide range of appliances including wood burning and multi fuel stoves and open fires. Specialist advice should always be sought when selecting the appropriate draught solution. 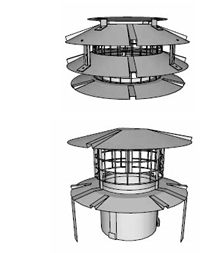 Chimney fans must operate in accordance with the requirements of BS EN 15287-1. The terminal is designed so that it will not restrict the draw of the chimney. If downdraught is being experienced and other factors have been ruled out, a stainless steel anti-downdraught terminal can enhance the airflow and the performance of the chimney. Stainless steel anti-downdraught terminals are also designed to provide weather, bird and debris protection to the chimney. Stainless steel terminals can be fitted to all types of flue and chimney installation in stainless steel, clay/ceramic, concrete and pumice chimney systems. They can be supplied either as part of the chimney system or can be obtained separately from reputable chimney terminal manufacturers.